CRAFTS – Gotta Make That! There are many opinions of what type of pen to use. I went with the oil based Sharipe brand. It was easy to find at Michael’s and on sale. Some have suggested Pebeo Porcelaine 150 paint markers, but I had already found the very prominently displayed Sharpie pens. If you try the Pebeo, let me know how it compares. First I searched for a bunch of tips on how to get your beautiful sharpie art to stay on your mug after washing. Sounds like the best way to do this is to clean your mug with alcohol. Apply your design. Free hand it, or use a stencil. I used my Silhouette machine to cut out a saying in vinyl, and used that as my stencil. My hand writing is atrocious, so I figured it was my best bet. Various places like Amazon, or Michael’s Martha Stewart brand, have stencils you can buy if you do not have a silhouette. 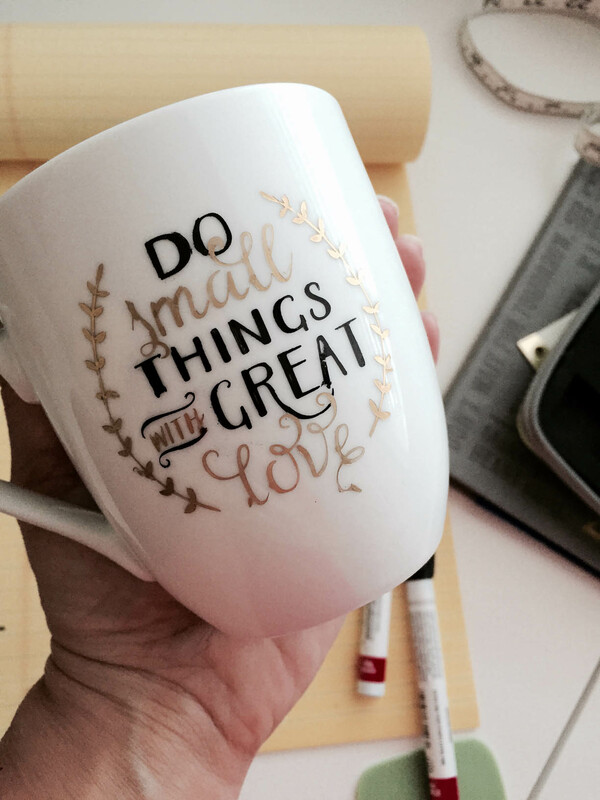 If it is a firm plastic stencil, it could be tough to apply to the mug and keep in place. I would suggest a stencil on the smaller side. You can wipe off mistakes if you use a q-tip and a tiny bit of water. After coloring in your design with your special sharpie, you should let it dry for twenty four hours. Place in a cool oven, set it to 425 degrees (although there is a lot of debate on actual temperature) and bake for 30 minutes. After that, turn off oven, and let cool completely inside oven. They say a sudden change in temperature can crack the mug. There is also much debate on whether you can or cannot wash it in a dishwasher after the oven step. I don’t mind washing a few special mugs by hand to save me from having to redo the process all over again. Have you tried this at home? If so, what were your tips for success? Note: After baking the mug, the gold pen turned silver in color. I will try the Pebeo markers next time, and see if the colors stay true.